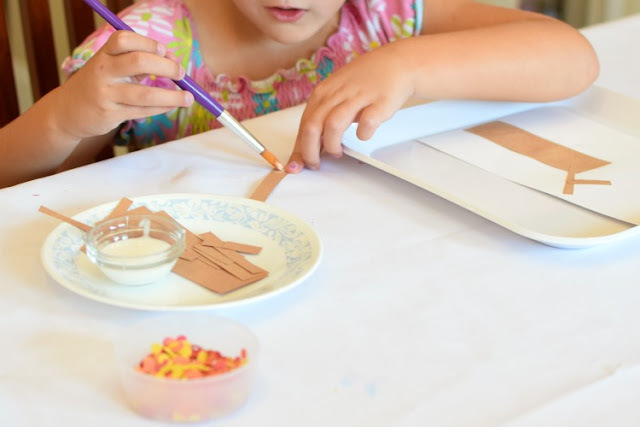 The weather around here is still crazy hot, but maybe if we do enough fall crafts we can cause the temperature to turn. Perfectly reasonable, right? Since we've never done a fall tree craft, I figured it was about time to give it a try. Any time we use the hole punch, I love all those tiny little circles that come out! 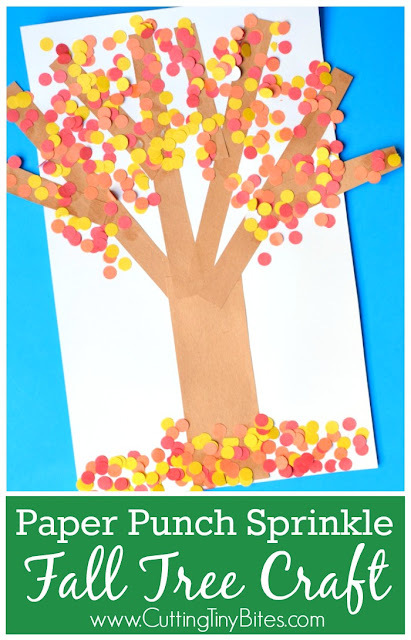 For this Paper Punch Sprinkle Fall Tree Craft we put them to good use, turning them into leaves for our autumn tree. My girls (and our neighbor friends) enjoyed sprinkling the little leaves on their trees, and they got a good little fine motor workout as well! Cut your white cardstock in half. I've found that young children do a much better job of managing projects when they're a smaller size. 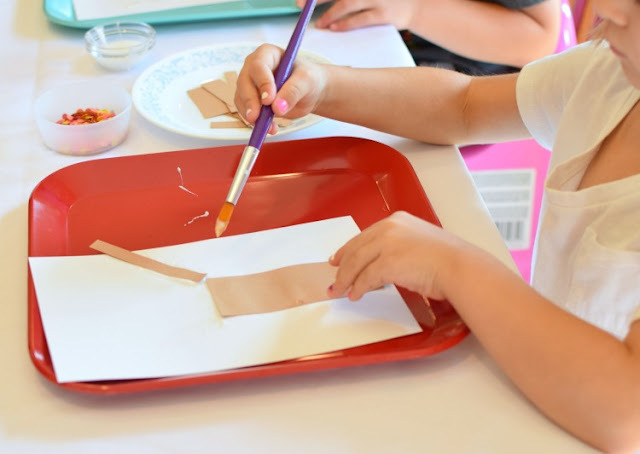 Cut brown construction paper into rectangles in a variety of sizes. 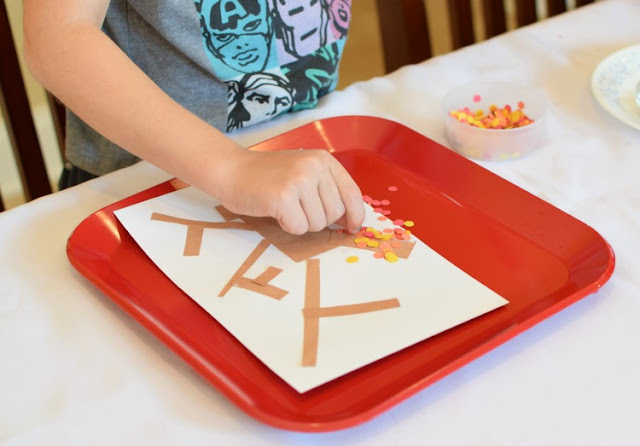 Your child will use these to make a tree trunk, branches, and limbs. 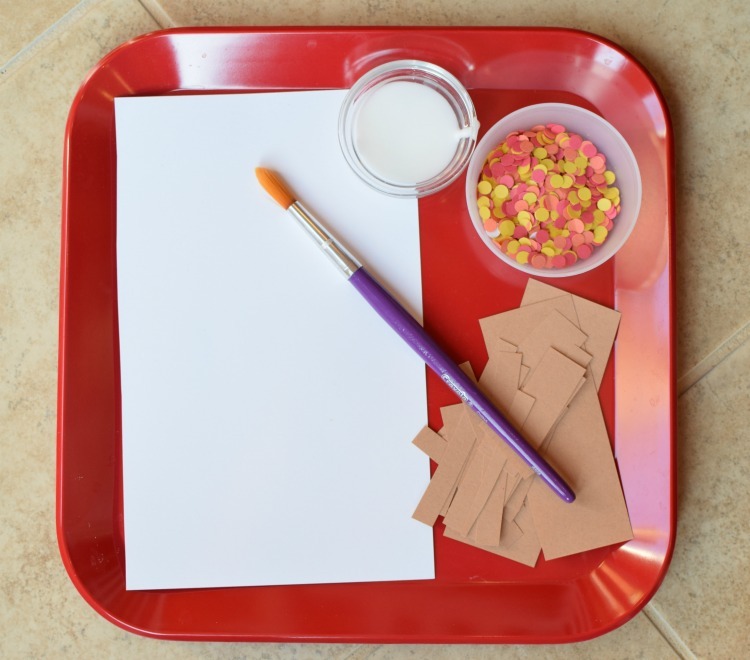 Punch holes in the red, orange, and yellow construction paper. 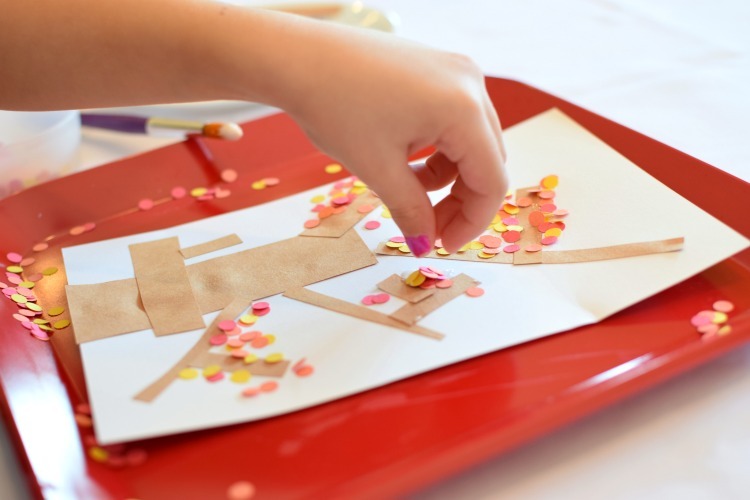 Make lots and lots of holes- let your kids help you if they can squeeze the hole punch! Gather the little circles into a small bowl. 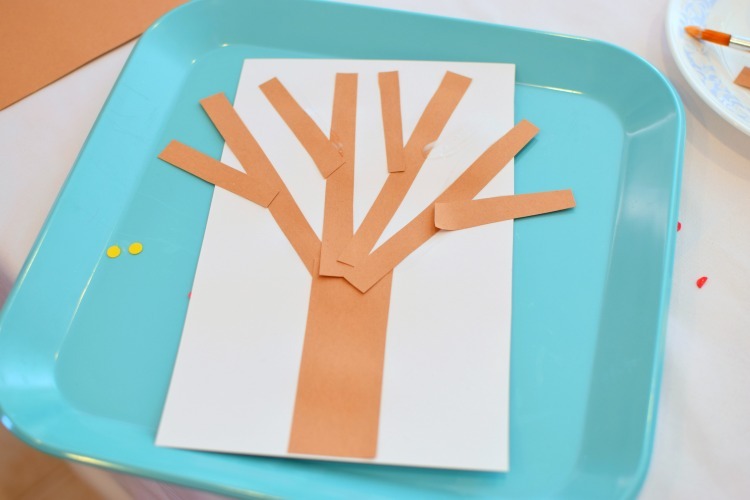 Start by letting your child build a tree with the brown rectangles. They'll use a short, thick rectangle for the trunk and thinner rectangles for the branches. We like using a paintbrush with school glue because it puts just the right amount of paint on the paper and doesn't leave the residue that a glue stick can. After you've built the tree, it's time for the best part! Paint a small amount of glue on and around the branches. 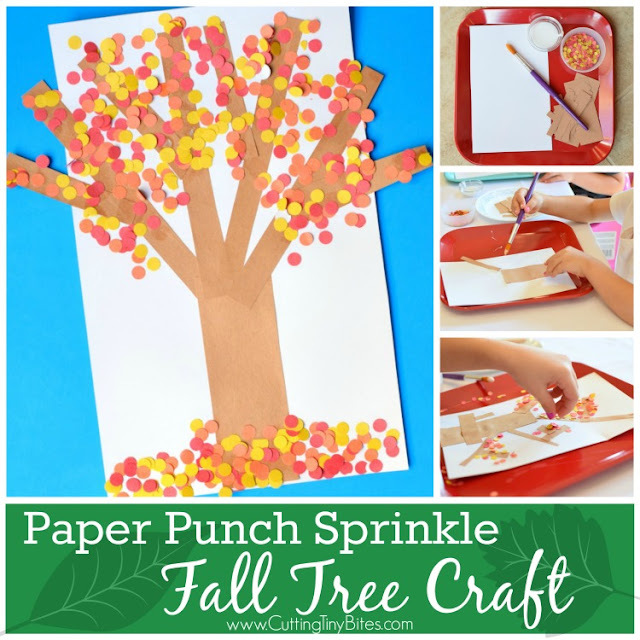 Let your child get small pinches of the paper circles and sprinkle the "leaves" onto the tree. Some will stick to the glue. Others will come off when you shake the tree and you can put them back in the bowl for more sprinkles. You can even add a pile of fallen leaves on the ground at the base of the tree! 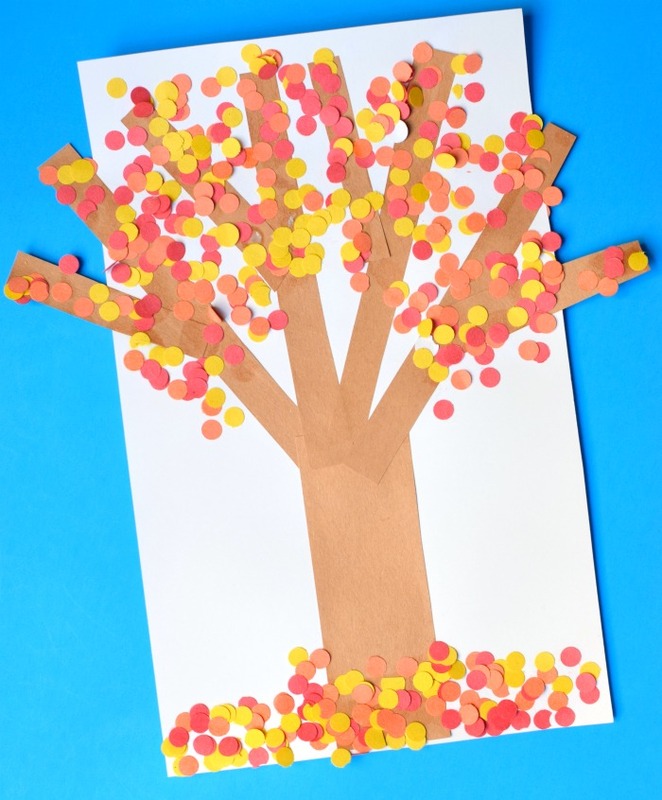 Fall tree craft for toddlers, preschoolers, or kindergartners. 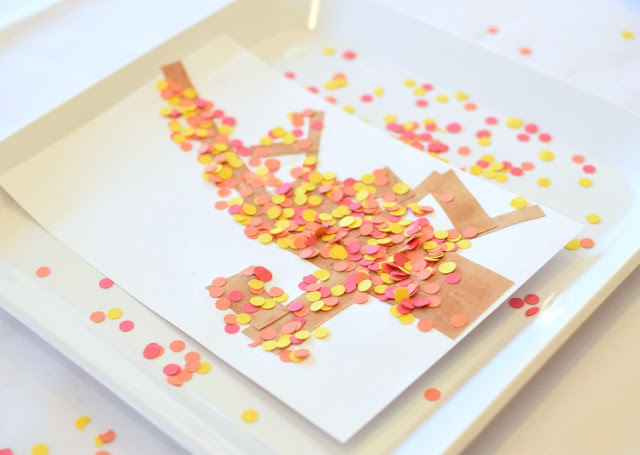 Use hole punch circles in red, orange, and yellow to make autumn leaves! Great fine motor work!